Jane Yolen has published over 200 books for both children and adults. Many of her books update classic folklore, such as Briar Rose, a retelling of Sleeping Beauty, and several have an Arthurian theme. Her books and short stories have won numerous awards. Ms. Yolen has often been called "America's Hans Christian Andersen". 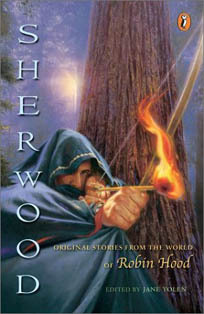 Her involvement with the Robin Hood legend includes editing (and writing one story for) Sherwood: Original Stories from the World of Robin Hood in 2000 and incorporating Robin Hood themes into her Young Merlin Trilogy , particularly the final book Merlin. She has served as past president of the Science Fiction Writers of America and has been on the board of the Society of Children's Book Writers and Illustrators for over 25 years. Born in New York City, Ms. Yolen and her husband divide her time between homes in Massachusetts, USA and St. Andrews, Scotland. Click here to go to Jane Yolen's official website . This interview was conducted via e-mail on June 30, 2002. AWW: In your introduction to Sherwood you talk about discovering Robin Hood through Howard Pyle's novel, and playing the outlaw legend in New York's Central Park. What appealed to you the most about the legend as a youth? And how does it appeal to you now? JY: What appealed to me was the sense of adventure and the idea that, despite having been outlawed for specious reasons, Robin went on to right wrongs and help the needy. These days I am also quite fond of the camaraderie and the sense of community working together for the good of all. AWW: How did you come to edit Sherwood, a new collection of Robin Hood stories? JY: It was a companion to a previous anthology I had done, about King Arthur, called Camelot. So it seemed a natural follow-up. AWW: What was your role in editing the Sherwood collection? How much input did you have in the content and character of the stories? JY: I sent out the call, inviting a number of writers specifically to send me a story, but also announcing the anthology in both the Science Fiction Writers of America publications and in the Society of Children's Book Writers' Bulletin. My requests were that the story be around 5,000 words or shorter, if possible have a young person as a central character in some way (it needn't be Robin himself), and be wonderfully and clearly written. Then I read all the stories, chose the ones that seem to fit the anthology, give it balance and weight. I got rather too many RH as a boy in Sherwood and could only publish a minimum of those. Some stories needed heavy editing, some very little. After I had all the stories chosen, I wrote my own, to fill in the missing area of Robin's life. AWW: How have readers responded to this collection? AWW: In the introduction, you write "Did it bother me that later on I would read stories that were tremendously different from the ones in this first book? It did not. Or that the names -- and spellings -- changed as well? I didn't care. I was always delighted to discover new versions, and I read them with an understanding that story -- like gossip -- changes in the mouth of the teller." I find this a refreshing attitude -- I still remember reading one review of the Kevin Costner movie, where the heart of the criticism was that it did not follow Howard Pyle and therefore got the legend "wrong". Obviously shifting versions of stories are something you must encounter a lot in your folklore research. What do you think are the virtues of having several versions of one legend? And what are your favourite changes to the Robin Hood legend? JY: It puzzles me that people think a protean story like Robin Hood (or King Arthur) must have a canonic storyline. If we know anything about folklore and legend, it is how malleable it is, molded by the tellers and their times. The thing that bothered me about the Costner Robin Hood was not playing fast and loose with the RH storyline (I liked the Muslim healer for example, and adored the scenery chewing sheriff) but playing fast and loose with English countryside. One simply cannot walk from Dover to Sherwood Forest in an hour or two! AWW: As a collection for youthful audiences, several of the stories in Sherwood feature children in some role. In the classic legend, children are pretty much absent. Do you think children make good narrators? JY: Children are great narrators for children's stories. In adult stories they bring a wide-eyed innocence to the telling, which too often translates into sentimentality. AWW: Also, a few of the stories prominently feature Marian, a character (who as you note in your introduction) was not in Pyle, or the earliest ballads for that matter. What do you think this character brings to the legend? In your mind's eye, what is Marian like? JY: Marian is iconic today for many writers precisely because she is so absent in earlier tellings. That gives the writer much leeway in discovering HER story. Also, she is a perfect vessel for today's need for strong women in story. In my mind's eye Marian is less beautiful than strong, capable, inventive. She is a twenty-to-twenty-first century woman in medieval clothing. AWW: Your own contribution to the collection, "Our Lady of the Greenwood" involves the fairies. What are your thoughts on the mythic elements of the Robin Hood legend? How did you come up with the idea for this story? JY: Not fairies in the sense of twittering, tiny winged creatures, but the amoral, tricksy transformative, demanding fairies of the old tales. I think the mythic elements were too often NOT explored and rather the Boys Own Life version of RH were the one's promoted. So being a Sidhe kind of writer, I went there instead. AWW: Sherwood isn't the only time that Robin Hood has entered your fiction. There are also elements which show up in your Young Merlin Trilogy. Merlin is found by a falconer named Robin. And in the third book, Merlin meets the forest-dwelling wodewose folk. They deem him to be Robin o' the Wood or the Green Man. What led to this blending of the Arthurian and Robin Hood legends? JY: In my research, there were suggestions by several scholars (can't remember who now) that there were times when the two great English legendary characters blurred in the folk mind (though centuries lay between them.) So it seemed like a fun thing to play with. AWW: What do you feel are the differences and similarities between the outlaw and Arthurian legends? JY: They are both about the "king" in disguise who distinguishes himself in his lower role first. They are both great romantic stories, full of adventure, honor, loyalty and disloyalty. But Arthur's tale is really about the change over from the pagan to the Christian worlds. Robin Hood is thoroughly Christian already, so is free to comment on aspects of the church (drunken monks, greedy prelates etc.) that Arthur cannot. It takes the Greenman legend and thoroughly subverts it for Christian usage. Arthur is more symbolic (grail, Green Knight, holy warriors, round table, etc.) but there is plenty in the RH canon for symbol hunters if they want to look. AWW: So, what are you working on now? And would you like to return to the Robin Hood legend at some point? JY: Just finished a big Young Adult Arthurian novel called Sword of the Rightful King which will be out in the spring of 03. I may be done with Arthur for a while. I have no plans to do more on RH right now. But one never knows. . .
AWW: Thank you very much for taking time out of your very busy writing schedule to answer these questions. Please visit Jane Yolen's Official Website. 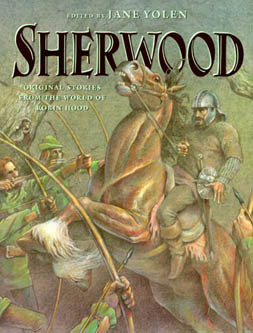 SHERWOOD edited by Jane Yolen. This is collection of original tales about Robin Hood and assorted characters.